One of our favorite Crock Pot meals is lasagna, and we have several different varieties that we love. It's so much quicker to put together in the slow-cooker, because you don't have to pre-boil the noodles or anything (if you did pre-cook the noodles, you'd end up with severely overcooked, gluey noodles - not appetizing). Toss all the ingredients together in the morning (or even at lunchtime), and by dinner, you have a meal people will think you slaved over! Cover the sauce with a layer of uncooked lasagna noodles (break them into pieces as necessary to fit). Add a few spoonfuls of cottage cheese. Chop onions, peppers, mushrooms, etc. Cover with a layer of shredded mozzarella. and noodles reach desired consistency. You can serve this dish with your favorite garlic bread and a salad, or on its own as a full meal. For lower-fat versions of the lasagna, simply increase the amount of veggies and reduce the cheese accordingly. You can also add your favorite Italian sausage or other meat, if desired, but the layers of veggies give this dish so much flavor that my carnivorous family doesn't even miss the meat! Update: I had someone ask me a question about whether or not the noodles get too soggy in a dish like this. I prefer firmer noodles, so I often cook my lasagna for only 4-5 hours. You can also regulate the firmness of the noodles by the amount of sauce you use: adding more (for softer noodles) or less (for firmer noodles) as desired. LOVE THIS!!!!!!!!!!!!!!!! 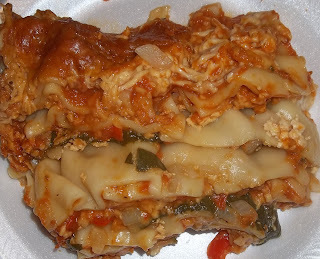 I love lasagna, and even more, I love when I find recipes I can use my slow cooker. Thanks for sharing this!